Rome is a lively city filled with an amazing atmosphere of its great history. Even if you haven’t been to Rome yet, you definitely know about its gorgeous historic attractions. So, most people who come to this ancient city mainly focus on visiting those important historical sites. 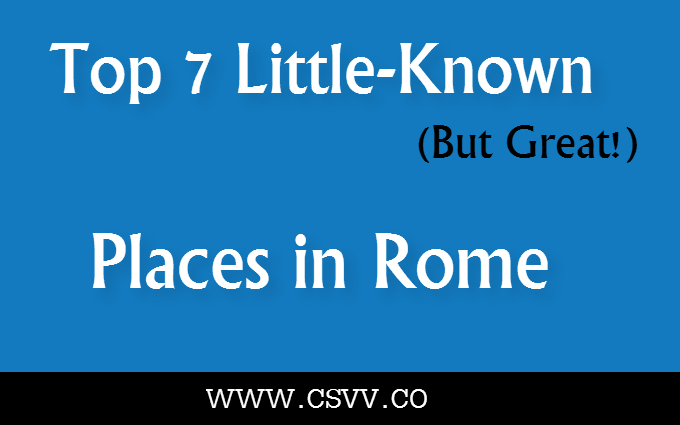 However, sometimes it’s more fun to avoid common tourist routes and to discover Rome from the point of view of the locals. In this case, the Italian capital will surprise even those who have already been there! In Italy the process of cooking is like an art. If you try to find a synonym to the phrase “Italian food”, it will be not risotto, lasagna or even pizza, because only pasta can fully represent the fascinating taste of Italian cuisine! In the Roman Museum of Pasta this product helps to perceive the history of Italy. At the fascinating exhibition of the museum you can see vintage rolling pins and modern gadgets for preparing pasta, and also find out how pasta influenced the economic development of Italy. They say that after a visit to the museum, some visitors start feeling extremely hungry, while the others have a desire to adopt a parody religion of Pastafarianism. A river in Rome is not very noticeable, so when you come to the embankment of Tiber for the first time you will have a strange feeling, as if you’re not in Rome, but somewhere in a different place. In high summer the embankments are filled with tents, stalls, orchestras, projection screens and strolling couples. But if you move upstream, then at some point you will see no people there. In the northern part of Rome instead of the stone promenades the embankments are filled with lush thickets, where the Romans love spending their time in winter and summer. On weekends there are lots of mobile markets in Rome. Farmers from Lazio and neighboring regions bring there their cheeses, sausages, vegetables, fruit and other produce. For example, there’s a market held by the association of Campagna Amica, which opens every Saturday and Sunday near the Circus Maximus. The market produce is more expensive than in the store, but the quality of products is worth it. Along with that, in the market you can try gorgonzola and grana padano cheeses, truffle oil and other products. And it’s not necessarily to buy what you were offered to taste. Ai Monasteri pharmacy-shop in Rome was open in 1894, and neither interior of the store, nor the range of goods have changed since. This place will carry you several centuries back and you’ll be able to buy cosmetics that Italians have used for centuries. All the goods in the store are produced on the territory of seven monasteries according to the old recipes. For example, you can buy there an “Elixir of Love”, an “Elixir of Happiness” and many other tinctures. With a bottle of an elixir you will get an instruction for use. In addition to alcoholic liquors, Ai Monasteri offers all kinds of honey and jams, oils, creams, perfumes for children and the most incredible kind of soap – e.g. with the flavor of artichokes or tomatoes. Another way to have a lovely time in Rome is to go to the cafe on the roof of the Capitoline Museum. Want to know where it is? As soon as you reach the Capitol Square with the sculptures of Michelangelo turn right and walk towards Piazzale Caffarelli, where you will see the back door to the museum (there are no signs, and you needn’t pay for the entrance). When you climb the stairs to the top floor, you will find a café. The main advantage of the place is a terrace with stunning views of Rome and a delicious coffee! A visit to the Cinecitta studio is a real insight into the history of cinematography. This is where Elizabeth Taylor and Richard Burton first met – while shooting “Cleopatra”. More than 3000 movies including such films as “Ben Hur”, “Sweet Life” and “Gangs of New York” by Martin Scorsese were shot in the pavilions of the studio. During the tour around the studio you will see the displays of sets and costumes, and an exhibition dedicated to the actors and directors who used to work there. Ostia Antica is a small town washed by the Tyrrhenian Sea and a favorite destination of the Romans for summer weekends due to its proximity to the city – only 30 km away! The town offers both paid beaches, with umbrellas and sunbeds included in the price, and free of charge beaches. Ostia is located near Fiumicino airport, so you can take a taxi to Ostia directly from the airport and within twenty minutes you will find yourself on the beach! The water there is not as clear as in Sardinia and Salento, but it’s quite a favorable place for swimming and sunbathing. The line of the beaches starts in the city and stretches along Tenuta di Castelporziano reserve. By the way, if you want to save on the transportation expenses, it’s recommended to reach Ostia and the other aforementioned places by a rental car, which you can return whenever you need. So, when visiting Rome, it’s not necessarily to follow the crowds of tourists and wear yourself out to take a picture on the background of the famous city sights. It is much better to discover Rome from another side – in the light of its most interesting and unusual places!